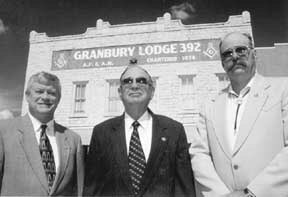 Left to right: Larry E. Boles, Master; Burton S. Burks Jr., District 65 Deputy Grand Master of the Grand Lodge of Texas and Charles B. Walton, Master-elect prepare for the 125th anniversary of the Granbury Masonic Lodge. In 1874, the Brazos River was a determining factor in the history and growth of the Masonic Lodge. In its earliest history in Hood County, Masons met at the Acton Lodge. Because they had to cross the Brazos River to get to Acton, many of the Masons had trouble getting to meetings. Crossing the river was sometimes impossible. At that time, Granbury was the new Hood County seat and it was beginning to grow rapidly. Changes began to occur and in 1922, the Acton Lodge affiliated with the Jubilee Lodge No. 599. In 1934, the Jubilee Lodge merged with the Granbury Lodge No. 392 that today has 455 active members. Now in its 125th year, the Granbury Masonic Lodge No. 392 A.F. & A.M. is celebrating its anniversary. Freemasonry is the world's oldest and largest fraternal organization. Its primary purpose is to promote character-building, faith in God and respect for every human being. The Granbury Masonic Lodge supports the Hood County life blood program, gives scholarships to Granbury and Tolar High School students each year, and gives the Lamar award of excellence to a teacher and student in Granbury and Tolar. In celebration of the 125th anniversary, Hood County judge Linda Steen has proclaimed Friday, June 25 as "Texas Masonic Awareness Day, Hood County, Texas."